On a dot of Danish land in the Baltic Sea, chefs have elevated local ingredients and sparked an island-wide culinary awakening. One evening at dusk I headed deep into a thick forest with the young chef Nicolai Nørregaard, crunching leaves and twigs once trampled, perhaps, by the wild bison that roam there. As we crossed muddy troughs and slippery moss, Nørregaard ducked under a log, crouching low to pluck a mushroom from the muck. “That’s a cèpe,” he said, “my favorite.” He snipped another and another with his fold-up Opinel knife, quickly filling a brown paper bag. The cèpes and chanterelles we collected, along with herbs and wild garlic foraged along the coast earlier in the day, would show up later on the tasting menu at his acclaimed restaurant Kadeau, which is perched on a bluff above the sea on Bornholm’s southern shore. The Danish island of Bornholm, a 225-square-mile teardrop in the Baltic—closer to Sweden, Germany, and Poland than to the rest of Denmark—has long been known for its idyllic terrain, with a dense forest surrounded by farmland in the middle, fine-sand beaches to the south, and a rocky, rugged northern coast. 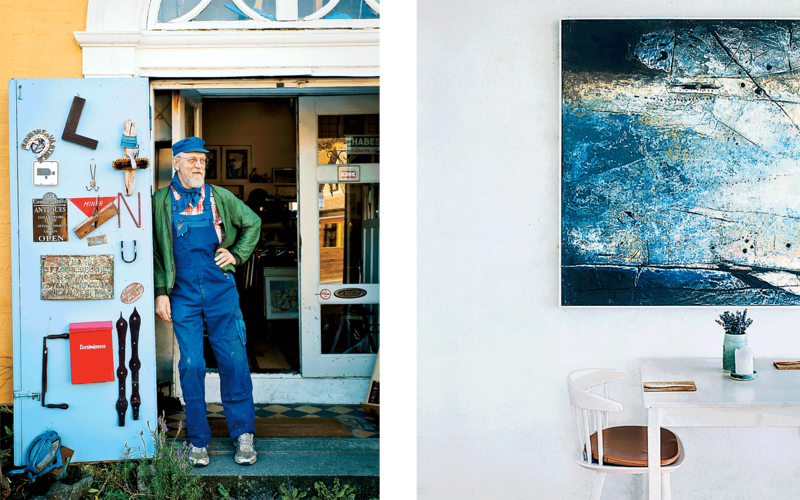 The island has inspired generations of artists: the “Bornholm school” of landscape painters who settled here early last century, as well as the glassblowers and potters who still sell straight from their workshops. In recent years, thanks to a new generation of chefs and food producers, it’s become a gastronomic destination, too. Nørregaard, who was raised on the island, opened his restaurant with a childhood friend in 2007, transforming a beach-shack café into a trailblazer of the modern style of locavore cooking known as New Nordic cuisine. “We wanted to pay tribute to Bornholm, to feature the island’s best ingredients,” the chef said. “If we couldn’t find something, we’d grow it ourselves.” Today, his newly Michelin-starred Kadeau exemplifies Bornholm’s close community. Its rustic plates and bowls are all handmade by a ceramist in the village of Listed. Nørregaard’s father tends to the restaurant’s farm plots—berry bushes, pumpkin patches, and beehives scattered across the island—while his stepmother is on foraging duty. In the years since it opened, Kadeau has spawned an offshoot and two sister restaurants in Copenhagen and a second seasonal outpost on the island: the more casual Sommer Pony. Nørregaard grew up in Svaneke, a former fishing village on the eastern coast. His uncle once ran the best smokehouse on the island, Nørregaard told me as we wandered the town’s narrow streets one afternoon. Before the local fishing industry died out in the 1980s—the stocks of salmon, halibut, and cod ravaged by overfishing—there were dozens of smokehouses here. Though their distinctive red-brick chimneys are still visible everywhere, only two remain, serving smoky herring fillets Bornholm-style, with chopped shallots, chives, and a raw egg yolk on top. Svaneke today is better known for its sweets, having transformed in recent years into something of a real-life Willy Wonka town. Denmark’s top luxury producer, Lakrids, started here. Native son Johan Bülow opened the company’s first store on Bornholm in 2007. Today his sleekly packaged licorice balls are sold at high-end boutiques in London and New York City. In the past decade, the town has seen an explosion in sugary enterprise: Bülow’s uncle runs a hard-candy store; a cousin sells caramels down the street. Ice cream and chocolate shops have filled the void left when the fishermen disappeared. These days, every corner of Bornholm seems to have its own epicurean claim to fame. The forest in the middle—dense and untamed, like something from a Grimm fairy tale—is home to mushrooms, wild game, and the island’s last artisanal butcher, Hallegaard. At this award-winning charcuterie tucked deep in the woods, you can try house-cured meats and sausages at the café, where wood-beam ceilings and a boar’s-head trophy create a rustic yet modern vibe. Small farms are scattered between the forest and sea. They sell berries, jams, and freshly dug potatoes from unmanned booths, with honesty boxes for leaving your kroner behind. The northern coast’s culinary highlight is the much-lauded restaurant in the seaside Stammershalle Badehotel. This historic 16-room inn welcomed its first guests almost a century ago. In 2011, husband-and-wife team Henrik Petersen and Henriette Lassen bought and refurbished the place, taking care to preserve the nostalgic charm of its red-shingled roof, model ships, and frayed portraits of Denmark’s royal family. A Bornholm native, chef Daniel Kruse, was brought on to run what’s since become an excellent restaurant devoted to local produce. 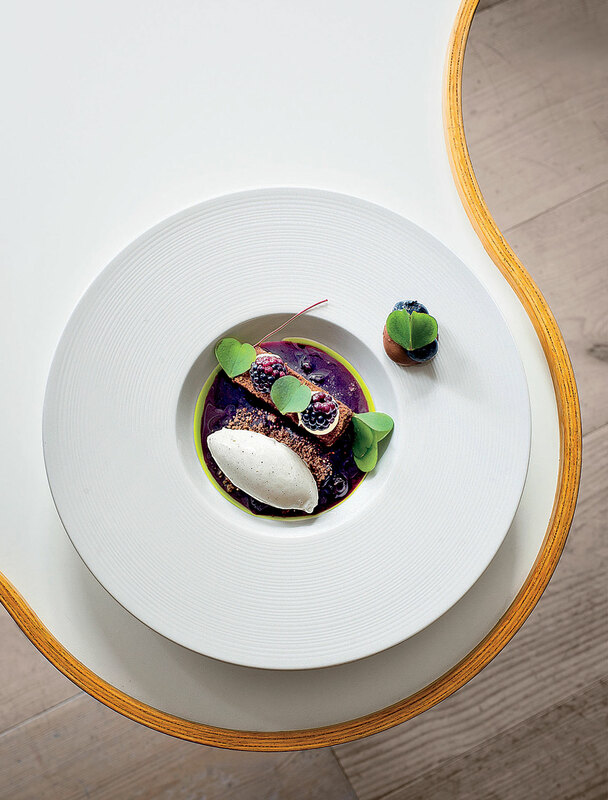 It quickly earned a reputation for inventive meals capped off with elaborate desserts, like the tableau of caramel cream and blackberry mousse speckled with fresh herbs that ended my dinner one night. And though Kruse recently handed over the reins to a new team, chef Mathias Sejer Sørensen and pastry chef Andrea Aguirre Suarez, the restaurant’s locavore ethos has remained firmly in place. 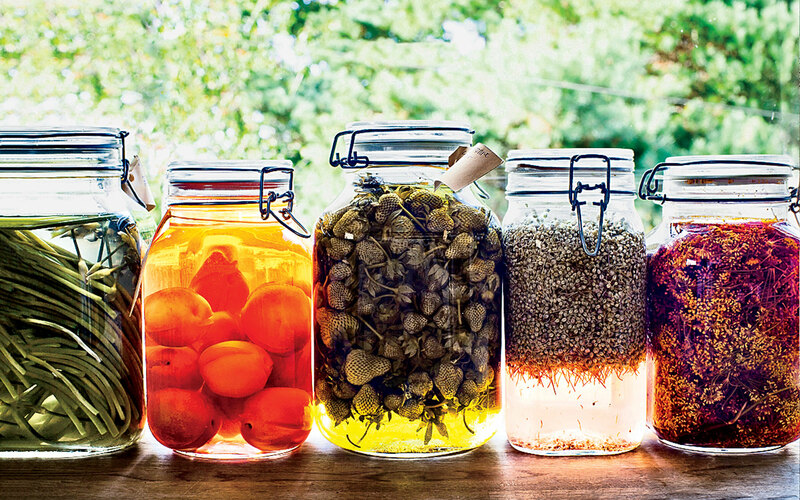 “On Bornholm you know everyone—the farmer, the fisherman—so it’s easy to get the best ingredients,” Petersen says. Because it’s only a half-hour’s flight from Copenhagen, Bornholm has become a new mecca in the culinary community. Diners from around the world now add it to their pilgrimages to Noma. No one is more surprised by this than Nørregaard. “We were a bit nervous when we took over this place in the middle of nowhere,” he said. “We placed ads in the paper. Word spread slowly at first—then it exploded.” Kadeau is now busy all summer long, and one meal is enough to understand why. At dinner, the mushrooms we found in the forest were tossed with black-currant-leaf oil, local peas, and mussels. Freshly baked bread made with Svaneke beer came with tangy house-churned butter. Warm smoked salmon arrived on smoldering hay with dried cornflowers and rhubarb vinaigrette. A fire pit glowed outside as the sun vanished behind the dunes, the Baltic whitecaps fading to black. Fly to Rønne via a connection in Copenhagen. Melsted Badehotel: A cozy, renovated hotel from 1932 with a fine restaurant and great Baltic Sea views. Gudhjem; melsted-badehotel.dk; doubles from $255. Nordlandet Hotel: A seaside B&B with an appealing, minimalist Scandinavian aesthetic and a lovely terrace. Allinge; hotelnordlandet.com; doubles from $181. Stammershalle Badehotel: This quirky 16-room inn with an excellent restaurant feels like something plucked from the set of a Wes Anderson movie. Gudhjem; stammershalle-badehotel.dk; doubles from $135. 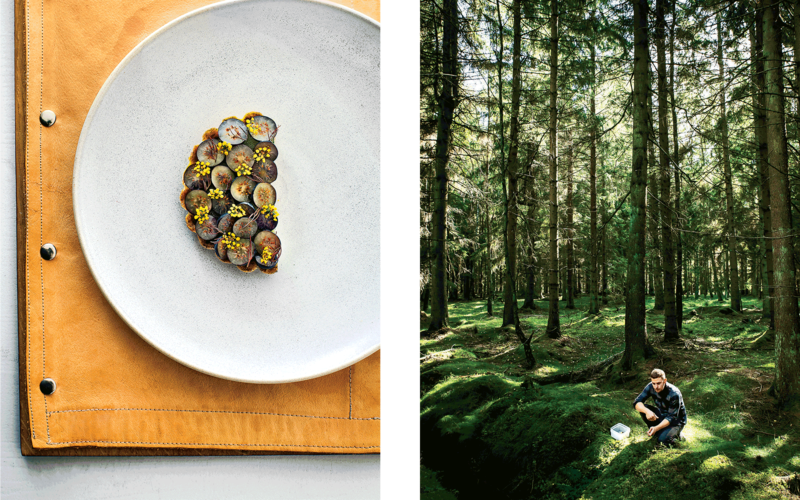 Christianshøjkroen: Modern Nordic cuisine that’s fresh, seasonal, and a great value—all in a beautiful forest setting. Aakirkeby; christianshojkroen.dk; tasting menus from $56. Hallegaard: Stock up on housemade charcuterie at the shop, or snag a table at the café to sample the selection of dishes centered on cured meats. Østermarie; hallegaard.dk. Kadeau: An inventive restaurant serving dishes like clams with fermented wheat and pickled pinecones are reason enough to book a ticket to Bornholm. Aakirkeby; kadeau.dk; tasting menus from $120. Lakrids: This boutique from the lauded candymaker offers licorice in flavors both traditional (salty, sweet) and unexpected (habanero, chili cranberry). Svaneke; lakrids.nu. Nexø Gamle Røgeri: The best old-fashioned smokehouse on the island. Try the smoked fish and smørrebrød. Nexø; n-g-r.dk; entrées $7–$20.